When the Brexit meeting in Salzburg, Austria broke down last week, none of the EU leaders more opposed to Ms. May’s doomed ‘Chequers’ plan seemed to be French President Mr. Emmanuel Macron. His opposition to UK Prime Minister Theresa May has by now taken on the form of a ‘tantrum’ where he has insisted that the UK either provides a solution for the Irish border (one of the two sticking points remaining) or he will simply not show up for the Brussels meeting where the UK-EU Brexit agreement should be signed in November. 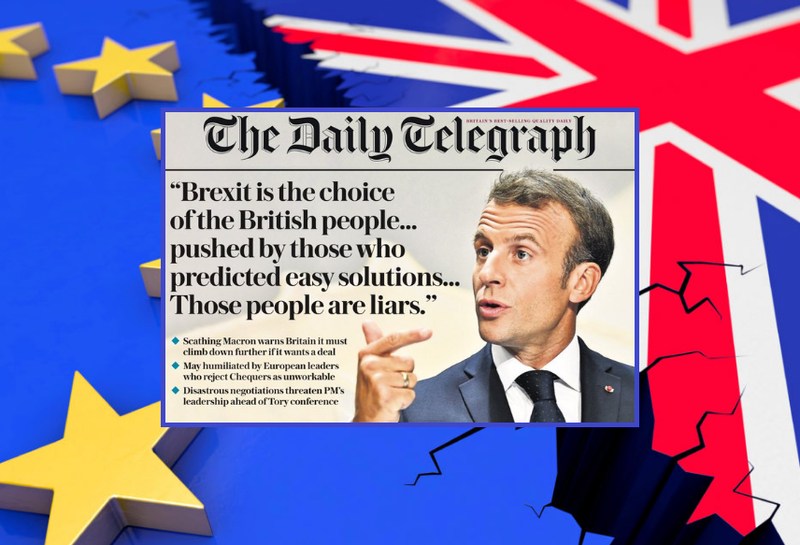 Related coverage: <a href="https://thegoldwater.com/news/37802-Brexit-Sunday-Times-Claims-Tories-Plan-Snap-Elections-In-November-Video"> Brexit – Sunday Times Claims Tories Plan ‘Snap Elections In November’ (Video)</a>. However, Brexit negotiators admitted that the French President refusing to attend a summit would be seen as a 'nuclear option' which would almost certainly spell the end of negotiations. German chancellor Ms. Merkel meanwhile, who is clearly at the end of her political career, would not like to be remembered for a failed Brexit negotiation and is urging her French counterpart to give in. In the meantime, Brexiteers are pushing Ms. May to either make a clean break (a so-called ‘No-Deal Brexit’) or to present a solution for the last remaining items to be negotiated quickly. I wonder how has the UK ever managed to exist for centuries without this crooked, corrupt EU! Clearly it is a manipulated arrangement between May and Macron to prolong or avoid the actual finish line. If both were so adamant they would sign and be done with it.